After two weeks, the investment volume continues to rise. Here, we'd like to thank you for your continued support. 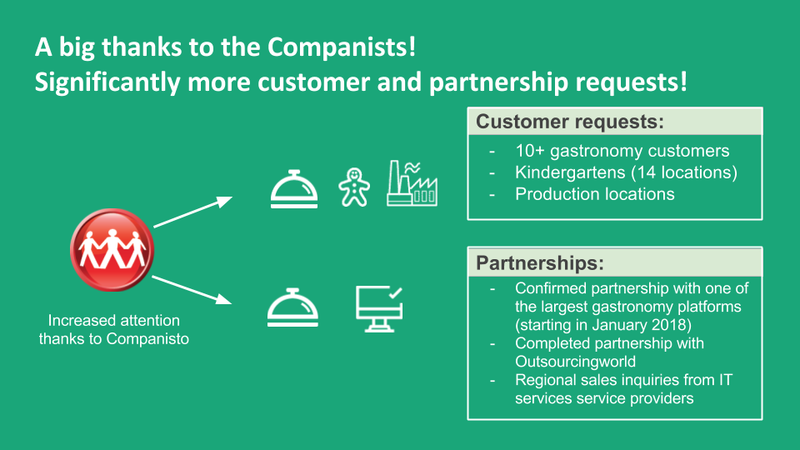 Through the expanded visibility from our financing round on Companisto, we received multiple partnership offers from businesses that would like to sell HACCP24 for us. We've already entered talks with these companies and will be meeting in person next week. This week, we've received a confirmation from two larger hotel groups and a catering business that they will be entering a test phase with us after the summer. An additional project on which we've been working for over six months has been announced for the implementation of Q1 2018. This is a newly formed company that is setting up a 360° catering service for which HACCP24 will be a core component. What's more, the sales and redistribution restructuring efforts are well underway. We hope to be able to present you with the first positive results by the end of August.